SCR ransomware is a hazardous file locking Windows virus which is related to the Matrix category. These cyber threats are known for their difficult operating, stealth spreading techniques, and secret encryption process which is performed by using strong AES-128 and RSA-2048 cryptography. SCR virus adds the .SCR appendix to each locked file and folder. After that, the crooks display a !README_SCR!.rtf informative message which urges to pay a particular ransom price or encrypted data will be deleted permanently after a time duration of seven days. Additionally, the hackers urge users to contact them via all three email addresses in case a misunderstanding happens and the message does not reach the recipient. Continuously, victims are offered to send three files which together contain no more space than 5 MB in order for the crooks to demonstrate that they are truly capable of decrypting the data. SCR ransomware is a type of malware which can perform different activities all over the system. It can run rogue processes in the Windows Task Manager, create malicious entries and inject them into the Windows Registry section. Moreover, the ransomware might carry other harmful cyber threats or infected executables and leave them in the system also. To continue, SCR ransomware might be capable of deleting Shadow Volume Copies of encrypted data. 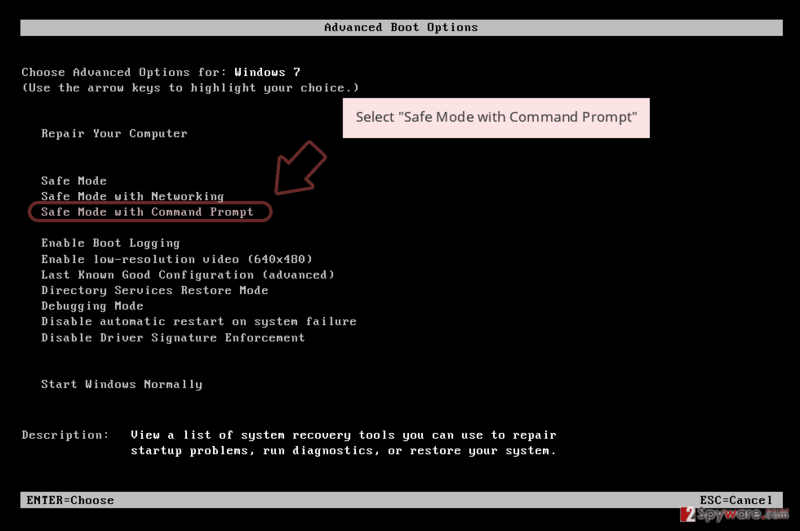 The cyber threat launches a specific command to perform such a process. Crooks release the ransomware with such additional feature as eliminating Shadow Copies will not allow decrypting files by using tools which require untouched Shadow Volume Copies. We recommend performing the SCR ransomware removal with reputable computer security software. 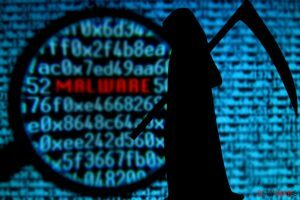 Moreover, you need to detect all additional malicious content that might be hidden all over the Windows operating system. We offer to try a tool such as Reimage as by terminating the cyber threat on your own, you might cause more damage to your computer system. Remove SCR virus before it performs malicious processes and disables you from recovering files on your own. 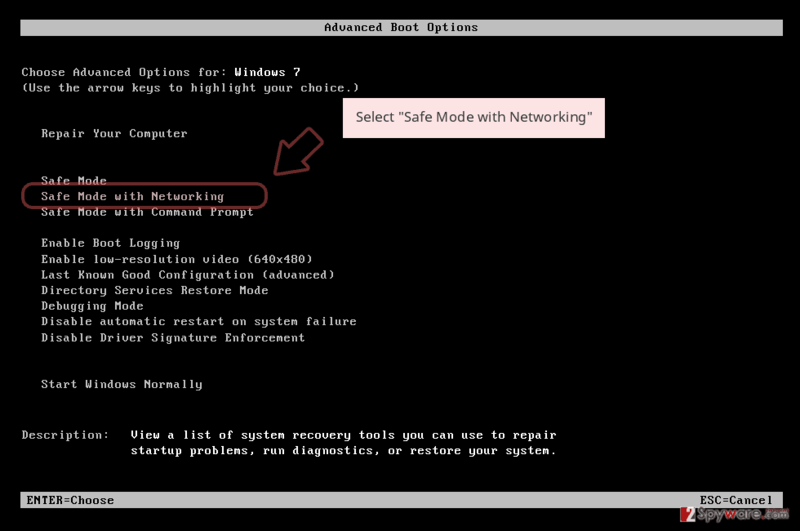 After the removal, try some data restoring tips that are presented below this article. Make sure that you choose the most suitable one regarding your situation and carry out each step as carefully as possible. For further protection from threats such as SCR ransomware, we advise you to keep on reading this article further and gaining some knowledge on ransomware prevention tips. One more thing you need to know is that storing data on portable servers and devices will ensure that the information is inaccessible for others, including, potential criminals. 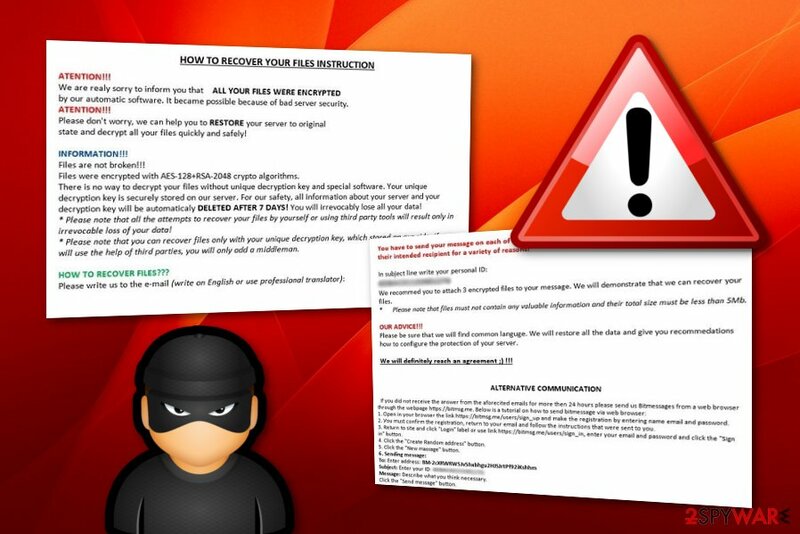 According to researches done by tech experts from NoVirus.uk, ransomware viruses are injected into various text files or executables, attached to dubious spam messages and sent to random users. Some hackers pretend to be authorities sent by worldwide organizations that are writing with a very important matter to discuss. Be careful once you receive an email message that you were not waiting for. You should always scan the attachment with reliable anti-malware, incase ransomware-related payload has been sent to you. Additionally, if an email message falls to the spam section, you should delete it immediately without even considering to open it. For further information, we can say that ransomware viruses also have other spreading sources such as peer-to-peer networks, indirect downloading hyperlinks, malicious ads, etc. 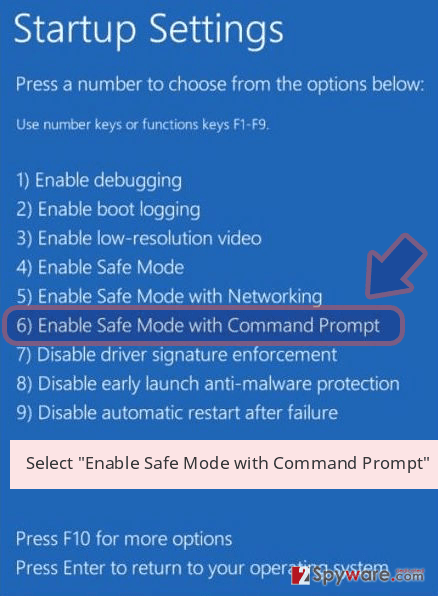 The main key to your computer's safety is your own cautiousness and the security measures you take to protect the machine and your files that are stored on it. Ransomware viruses are sneaky cyber threats which can hardly be removed by the user himself. You need to have a wide range of skills to be able to perform the ransomware removal on your own. However, do not risk damaging your system and use reliable anti-malware tools such as Reimage, Malwarebytes MalwarebytesCombo Cleaner, and Plumbytes Anti-MalwareMalwarebytes Malwarebytes to get rid of malicious content and remove SCR virus. SCR ransomware removal needs to done safely and effectively, otherwise, the malware might renew itself and its malicious processes within the next computer boot. Moreover, you can try some data recovery tips which are presented below the text. Remember, paying the demanded ransom price is not always an option as you might face unwanted money losses. Log in to your infected account and start the browser. Download Reimage or other legitimate anti-spyware program. Update it before a full system scan and remove malicious files that belong to your ransomware and complete SCR removal. 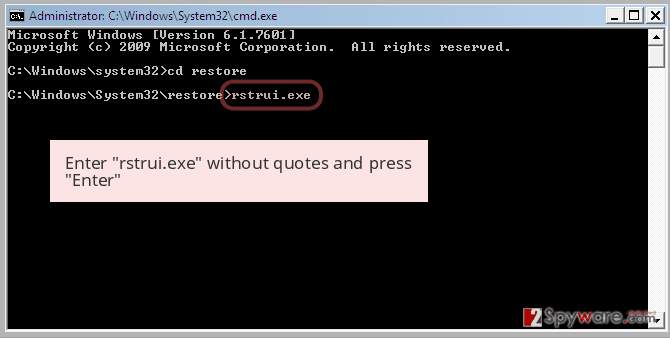 When a new window shows up, click Next and select your restore point that is prior the infiltration of SCR. After doing that, click Next. 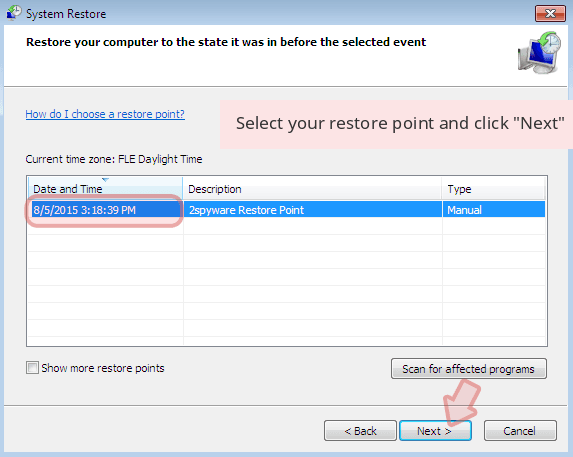 Once you restore your system to a previous date, download and scan your computer with Reimage and make sure that SCR removal is performed successfully. 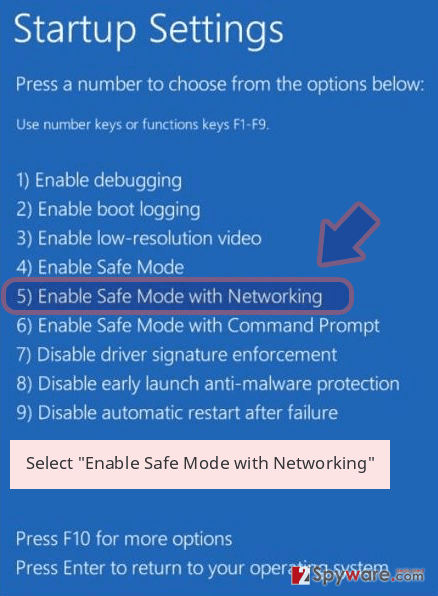 Guide which is presented above is supposed to help you remove SCR from your computer. To recover your encrypted files, we recommend using a detailed guide prepared by 2-spyware.com security experts. If you have found files encrypted by SCR ransomware, you should not rush and pay the cybercriminals. We recommend trying the below-provided data recovery methods some of which might appear to be successful and help you with file restoring. If SCR ransomware has locked your files, you can try to restore them by using this third-party tool. Try this tool if you want to recover some of your data. 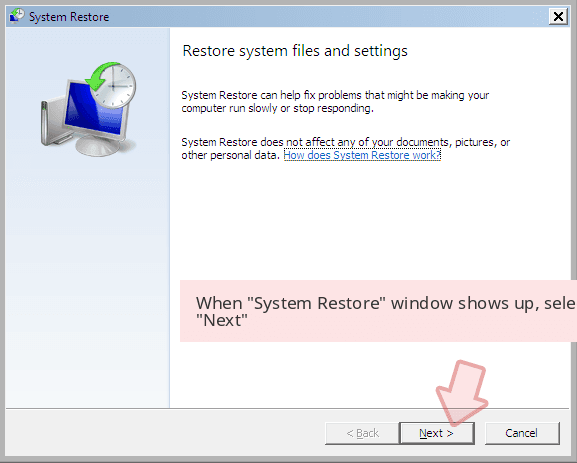 Make sure that you have activated the System Restore function before as it is necessary if you want this method to work successfully. Use this software to recover your files. Perform each step exactly as shown in the instructing guidelines as it should help you to achieve the best results possible. Technology experts are working on the SCR ransomware decryptor at the moment. ^ What is a hyperlink?. Digital Unite. Digital Skills. This entry was posted on 2019-03-20 at 08:27 and is filed under Ransomware, Viruses. You can quickly scan the QR code with your mobile device and have SCR ransomware manual removal instructions right in your pocket. How did you remove SCR virus?